The RF device and process technology markets are heating up, especially for two critical components used in smartphones—RF switch devices and antenna tuners. RF device makers and their foundry partners continue to ramp up traditional RF switch chips and tuners based on RF SOI process technologies for today’s 4G wireless networks. And recently, GlobalFoundries introduced a 45nm RF SOI process for future 5G networks. RF SOI, the RF version of silicon-on-insulator (SOI) technology, makes use of high-resistivity substrates with built-in isolation. Then, seeking to disrupt the landscape, Cavendish Kinetics, a fabless IC design house, is ramping up a new and competitive generation of RF switches and antenna tuners based on an alternative technology, RF MEMS. RF switches and tuners are among the critical components inside a phone’s RF front-end module. The RF front-end integrates the transmit/receive functions in a system, and the RF switch routes the signals. Tuners help the antenna to adjust to any frequency band. With those challenges in mind, cellphone OEMs have to weigh tradeoffs for some new component choices. Specifically, for RF switches and antenna tuners it boils down to two technologies—RF SOI-based devices and RF MEMS. RF SOI is the incumbent technology. Devices based on RF SOI are capable, but they are beginning to encounter some technical issues. On top of that there are price pressures in the market, and there are issues as the devices migrate from 200mm to 300mm fabs. In comparison, RF MEMS have some interesting properties and are making inroads in select areas. In fact, Cavendish Kinetics says that its RF MEMS-based antenna tuners are being incorporated by Samsung and other OEMs. Still, the segment is worth watching amid a mixed business environment for smartphones, the big market for RF switches, tuners and other components. In total, smartphone shipments are expected to grow a mere 1% in 2017, compared to 1.3% growth in 2016, according to Pacific Crest Securities. On the other hand, the RF front-end module/component market for cellphones is projected to jump from $10.1 billion in 2016 to $22.7 billion by 2022, according to Yole Développement. In total, the RF switch device market was a $1.7 billion business in 2016, according to Strategy Analytics. Despite the shipment numbers for RF switches, there is stiff competition and price pressure in the market. The average selling prices (ASPs) for these devices are between 10 to 20 cents, he said. Meanwhile, in a simple system, the RF front-end consists of several components—power amplifier; low-noise amplifier (LNA); filter; and RF switch. Fig. 1: A simple front end module. Source: Globalfoundries, “Designing Next-Gen Cellular and Wi-Fi Switches Using RF SOI,” Technology, May 2016. 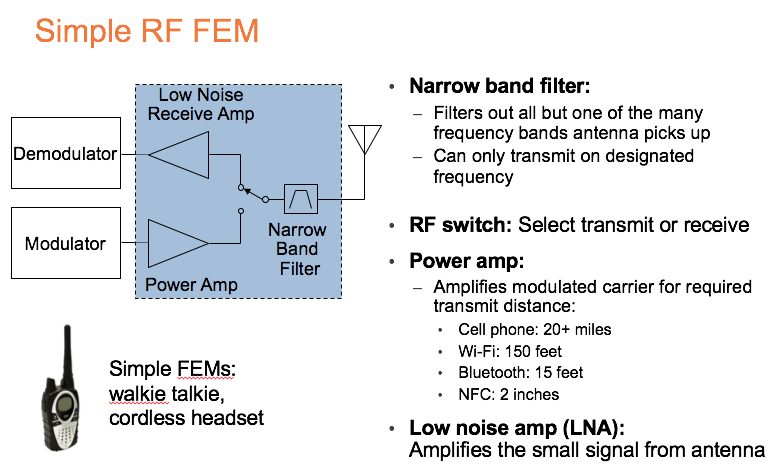 “The main purpose (of the power amp) is to make sure there is enough power for your signal or message to reach its destination,” said Randy Wolf, a member of the technical staff at GlobalFoundries, in a recent presentation. An LNA amplifies a small signal from the antenna. An RF switch routes signals from one component to another. “(A filter) prevents any unwanted signals from coming in,” Wolf said. In a cellphone, the RF functions were simple in 2G and 3G wireless networks. There were four frequency bands in 2G, and five for 3G. But for 4G, there are more than 40 frequency bands. 4G not only incorporates the 2G and 3G bands, but also a number of 4G bands. On top of that, mobile operators have deployed a technology called carrier aggregation. Carrier aggregation combines several channels, or component carriers, into one big data pipe, enabling more bandwidth and faster data rates in a wireless network. In contrast, smartphone OEMs may design regional phones for specific markets. “An example is handsets that are targeted at the China domestic market. In this case, the RF front-end needs to support bands specific to the region,” Dutta said. Fig. 2: A 4G front end. Source: GlobalFoundries, “Designing Next-Gen Cellular and Wi-Fi Switches Using RF SOI,” Technology, May 2016. LTE phones also have two antennas, main and diversity, according to Cavendish Kinetics. The main antenna is used for transmit/receive functions. Basically, a diversity antenna boosts the downlink data rates in phones. In operation, a signal reaches the main antenna. It then moves to an antenna tuner, which allows the system to adjust to any frequency band. Then, the signal moves into a series of RF switches. “It switches into the appropriate bands you want to use as far as GSM, 3G or 4G,” GlobalFoundries’ Wolf said. From there, the signal moves into a filter, followed by the power amp. Finally, it reaches the receiver. With this complexity in mind, cellphone OEMs face some challenges. Power consumption and size are critical. “Because of this complexity, you are getting more loss in the front-end, which is having a negative impact on your LNA total noise figure of your receiver,” Wolf said. Clearly, the RF switch plays a key role to help address the problem. 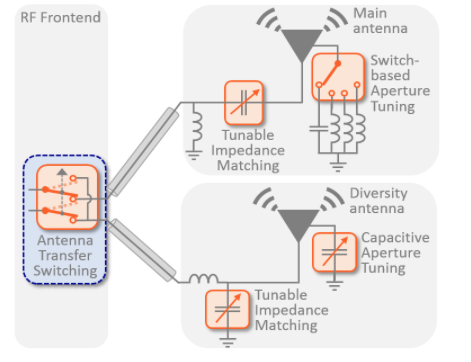 In total, a smartphone might incorporate more than 10 RF switch devices. A basic RF switch comes in a single pole, single throw (SPST) configuration. This is a simple on-off switch. Today, OEMs use more complex switch configurations. Ron*Coff is a key metric for RF switches. “Ron*Coff is a ratio of how much loss occurs when a radio signal goes through a switch in its ‘on’ state (Ron, or on-resistance) and how much the radio signal leaks through the capacitor in its ‘off’ state (Coff, or off capacitance),” according to Peregrine Semiconductor. All told, OEMs want RF switches with no insertion loss and good isolation. Insertion loss involves the loss of signal power. If the switch doesn’t have good isolation, the system could encounter interference. “Overall, the challenge for RF front ends is to support the increasing performance needs, aligned to evolving standards and increasing frequency band coverage. All of this while looking to reduce the size of the solution given the shrinking RF footprint, as phones get thinner. The key metrics like insertion loss, power at the antenna, and isolation are still drivers of the solutions within our RF portfolio,” Qorvo’s Dutta said. Today, for the power amplifier in cellphones, mobile OEMs mostly use gallium arsenide (GaAs) technology. Then, several years ago, OEMs migrated from GaAs and silicon-on-sapphire (SoS) to RF SOI for RF switches. GaAs and SoS, a variant of SOI, simply became too expensive. RF SOI is different than fully-depleted SOI (FD-SOI), which is geared for digital applications. Like FD-SOI, RF SOI has a thin insulating layer in the substrate, enabling high breakdown voltages and low leakage for RF. “The mobile market continues to favor RF SOI, as it delivers low insertion loss and harmonics and high linearity over a wide frequency range, good performance, and cost-effectiveness,” said Peter Rabbeni, director of the RF business unit at GlobalFoundries. Today, Qorvo, Peregrine, Skyworks and others provide RF switches based on RF SOI. Typically, RF switch makers use foundries to make these products. GlobalFoundries, STMicroelectronics, TowerJazz and UMC are among the players in the RF SOI foundry business. So, OEMs have several choices in terms of component vendors and foundry offerings. Generally, the foundries offer RF SOI processes anywhere from the 180nm to 45nm nodes and at different wafer sizes. The decision to go with one node or another depends on the application. “With regards to technology scaling in RF SOI, everything is about fitting technology solutions to the appropriate end application from a technology performance, cost and power standpoint,” said Walter Ng, vice president of business management at UMC. Even with the choices, RF switch makers face some challenges. The RF switch itself incorporates a field-effect transistor (FET). As with most devices, FETs suffer from unwanted channel resistance and capacitance. In an RF switch, the FETs are stacked. Typically, some 10 to 14 FETs are stacked in today’s RF switches. As the number of stacked FETs increases, the device may encounter insertion loss and resistance, according to experts. Another issue is capacitance. In an RF switch, 30% or more of the unwanted capacitance is attributed to the interconnects in the device, according to Skyworks in a paper in 2014, entitled: “Recent Advances and Future Trends in SOI for RF Applications.” The interconnects are the metal layers or tiny wiring schemes in chips, including RF SOI-based switches. 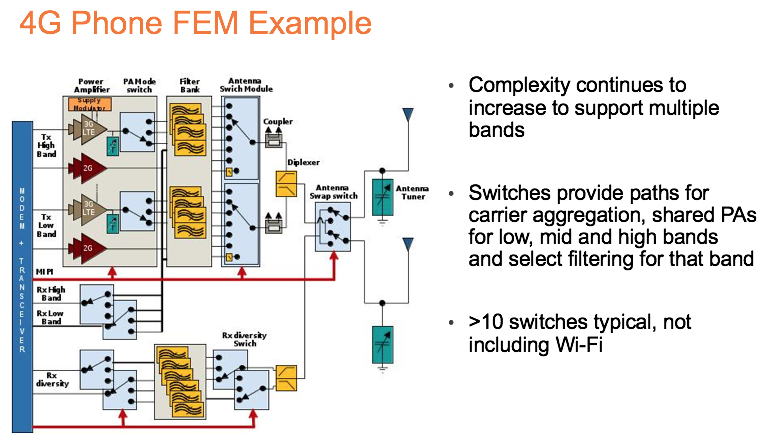 Generally, in 4G phones, the mainstream processes for RF switches are the 180nm and 130nm nodes in 200mm fabs. Many but not all of the interconnect layers are based on aluminum. Used in the IC industry for years, aluminum interconnects are inexpensive, but they also have a higher capacitance. Typically, copper is used on the top layers as ultra-thick metal options for improving passive device performance. “A thick top layer metal, preferably copper, improves performance by minimizing ohmic losses,” he said. More recently, RF device makers have been migrating from 200mm to 300mm fabs, where the processes range from 130nm to 45nm. Generally, the 300mm foundry fabs process wafers using only copper interconnects. By using only copper interconnects, switch makers can lower the capacitance. But 300mm also translates to higher wafer costs, creating some friction in the market. On one hand, OEMs demand lower prices in the cost-sensitive cellphone market. On the other hand, device makers and foundries want to maintain their margins. Until then, the industry may face some supply/demand issues on 300mm. “We believe that demand will continue to challenge supply until more of the production migrates to 300mm. Then, it will be a question of how quickly that capacity comes on line and how well it will match demand at the time,” he said. Generally, today’s RF SOI processes are geared for 4G phones. Seeking to get a jump in the 5G arena, GlobalFoundries recently introduced a 45nm RF SOI process for 5G applications. The process makes use of high-resistivity trap-rich SOI substrates. 5G is the follow-on to 4G. Today’s LTE networks operate from 700 MHz to 3.5 GHz. In comparison, 5G will not only co-exist with LTE, but will also operate in the millimeter-wave bands between 30 GHz and 300 GHz. 5G will enable data transmission rates of more than 10Gbps, or 100 times the throughput of LTE. But the mass deployment of 5G isn’t expected to occur until 2020 and beyond. Regardless, 5G will require a new class of components. “(45nm RF SOI) is focused primarily on enabling 5G millimeter wave front-ends, which integrate the PA, LNA, switch, phase shifters to create an integrated mmwave steerable beamformer for 5G systems,” GlobalFoundries’ Rabbeni said. For 5G, there are other solutions as well. RF MEMS is one possibility. In another possible solution, TowerJazz and the University of California at San Diego recently demonstrated a 12Gbps, 5G phased-array chipset. The chipset uses TowerJazz’s SiGe BiCMOS technology. RF MEMS has been in the works for years. Today, Cavendish, Menlo Micro and WiSpry (AAC Technologies) are developing RF MEMS for mobile apps. RF MEMS are different than sensor-based MEMS, such as gyros and accelerometers. Sensor MEMS are transducers that turn mechanical energy into an electrical signal. In contrast, RF MEMS conducts the signal. Initially, Cavendish and others have targeted RF MEMS for the antenna tuner market, where RF SOI-based switches and other technologies are used. In comparison, Cavendish’s tuners have 32 different capacitance ranges. “They are fully programmable and have a very high-Q performance. So they are very low loss. You can use these to tune your antenna to the range of frequencies you need to support,” he said. Going forward, Cavendish plans to take on RF SOI-based devices in the larger RF switch arena. “If you replace those with a real switch, which is a MEMS switch, then you can see the accumulated insertion loss benefit you get across your receiver or transmitter,” he said. But will RF MEMS devices displace those based on RF SOI? One company, TowerJazz, can perhaps provide some insights. TowerJazz provides traditional RF SOI processes, and is also the foundry provider for Cavendish’s RF MEMS devices. “There may be some small overlap where RF MEMS and RF SOI will compete for the same application. In general, they will complement each other (with) RF MEMS winning in the most demanding applications and RF SOI the rest,” said Marco Racanelli, senior vice president and general manager of the RF/High Performance Analog Business unit at TowerJazz.